Daryl Thomas Fordyce (born 2 January 1987) is a Northern Irish professional footballer currently playing for Sligo Rovers. He played for St Andrews and Lisburn Youth in his homeland of Northern Ireland, winning major trophies with both teams when he was younger. He played for Portsmouth. Working his way up through the club's youth ranks, Fordyce spent the second half of the 2005–06 season on loan at AFC Bournemouth before going back to Portsmouth. In July 2007, he signed for Glentoran in Northern Ireland. At the beginning of the Irish League 2010/11 season he netted 5 goals against Lisburn Distillery in the first game of the season in a 6-1 win. Daryl Fordyce agreed a deal with Linfield just after the end of 2010/11 season, although he was in contract re-negotiations with Glentoran. In 2012, Fordyce won the league title with Linfield after defeating Portadown 2–1 on 7 April. The team also lifted the Irish Cup for a record 42nd time, defeating Crusaders 4–1 in the final. Though Fordyce did not score in the final, he did score in Linfield's 5-1 defeat over Carrick Rangers. On 18 January 2013, it was announced that Fordyce, along with teammate Albert Watson would not return to Linfield the following season, instead seeking new playing opportunities in Canada. On 25 February 2013, it was reported that both Fordyce and Watson would join FC Edmonton. After 4 seasons in Edmonton, Fordyce would leave the club as it's all-time leading scorer. United Soccer League club FC Cincinnati announced that they had signed Fordyce on 16 January 2017. 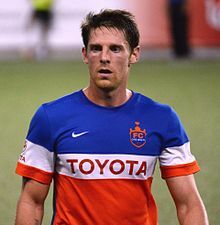 After seeing limited minutes with FC Cincinnati, Fordyce was released by the club in June 2017. Shortly after his release from FC Cincinnati, Fordyce re-signed with FC Edmonton. After the 2017 season, with the future of FC Edmonton and the NASL in doubt, Fordyce was released from FC Edmonton. Fordyce has represented Northern Ireland at Under-19 international, scoring both goals in their 2–1 European U19 Championship victory over Moldova in October 2005. He also scored four goals for Northern Ireland U-19 against Serbia & Montenegro. He has made 5 appearances for the Northern Ireland national under-21 football team, scoring against Germany in November 2006. ^ "Fordyce agrees to Glentoran move". BBC Sport. 2007-07-31. Retrieved 2007-09-01. ^ "Daryl Fordyce poised to join Linfield from Glentoran". BBC Sport. 13 May 2011. Retrieved 14 May 2011. ^ "Linfield beat Portadown to secure Premiership crown". BBC Sport. BBC. 7 April 2012. Retrieved 11 January 2013. ^ "Crusaders 1–4 Linfield". BBC Sport. 5 May 2012. Retrieved 11 January 2013. ^ "Daryl Fordyce and Albert Watson to leave champions Linfield". BBC Sport. 2013-01-18. Retrieved 2013-02-25. ^ "Watson and Fordyce will be part of 17 signings announced by Eddies on Monday". the11.ca. 2013-02-25. Archived from the original on 2013-08-24. Retrieved 2013-02-25. ^ Kimura, Fumi (16 January 2017). "Fordyce, Bahner Added to Roster for 2017". FC Cincinnati. Retrieved 23 May 2017. ^ "Fordyce, Luke to leave FCC". FC Cincinnati. June 30, 2017. 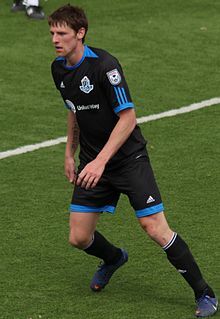 ^ "Daryl Fordyce returns to FC Edmonton". FC Edmonton. July 18, 2017. ^ "FC Edmonton announce four departures in Ameobi, Corea, Fordyce and Nyassi". FC Edmonton. November 16, 2017. ^ Steven Sandor (November 16, 2017). "With the club's path unclear, FC Edmonton begins releasing players". the11.ca. ^ "Fordyce hero for N Ireland U19s". BBC Sport. 2006-05-18. Retrieved 2007-09-01. ^ "Germany U21 2-1 N Ireland U21". BBC Sport. 2006-11-14. Retrieved 2007-09-01. Wikimedia Commons has media related to Daryl Fordyce. This page was last edited on 8 February 2019, at 21:01 (UTC).